The life of a touring artist: from the highs to the lows, the crowds to the loneliness, the glamour to the grind, it’s a different lifestyle that’s not for everybody. Fresh off the Summer of Strange Tour and veterans of of life on the road, ¡MAYDAY! 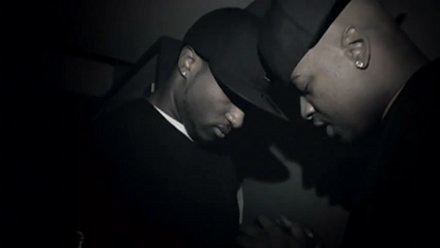 and Stevie Stone know a thing or two about riding down “Sinister Avenue”/”Outer Lane”. 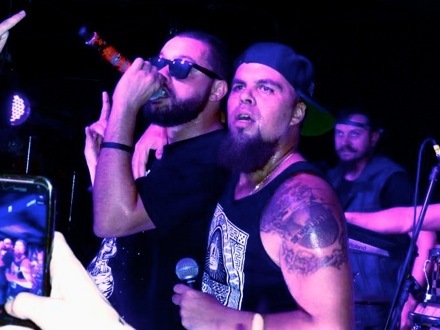 The Miami group and the St. Louis emcee teamed up to make the epic “Forever New” on ¡MAYDAY!’s Believers. The epic song is a picture perfect photo of the excitement and solitude that life on tour presents. We talked to Stevie Stone to get his perspective on what the song is about. The Missouri-born emcee with an insatiable hunger for touring shared with us the meaning behind some of his bars, gave us an insight into life on the road and told us what he thinks about Believers. This ¡MAYDAY! record that you’re on, “Forever New”, what is this song about to you? I think it’s real self-explanatory from the hook. “Living life under the black light, out here paying our dues. Sometimes I lose it and don’t act right / feeling forever new.” It’s just a mentality. It’s a wonderful song. When ¡MAYDAY! and them sent it to me I was so happy that they put me on the record because I really love talking about the road and what goes on the road, from the good to the bad. That’s what that is. It’s about being on the road and the good things and the bad things. I mean, it may be bad things to other people but it’s normal for us. We’re born to do what we’re made to do and we’re under a black light as we’re doing it, down Sinister Avenue, but we’re going full-force and we’re going hard. What did you think about the production when you heard it? It has a big feel to it, but it’s also very spacious and gave you a lot of room to do your thing, especially when you sing to open up your verse. Yeah. I love beats like that, that give you that space. It got that classic sound to it (hums the guitar melody with the drums). You know, the hi-hats are just going and it’s just beautiful. It’s just one of those records that you can sit and close your eyes and really take something from the music alone. When the hook was put onto it, it was like cake with icing on it. It was a beautiful mess all together. I’m sure you’ve heard a lot of the album being on the road with ¡MAYDAY! on this tour you just got done with, what do you think of the album? I love the album. I love the content, I love the subject matter and what they’re doing with it. The whole concept of the album: make these folks believers. 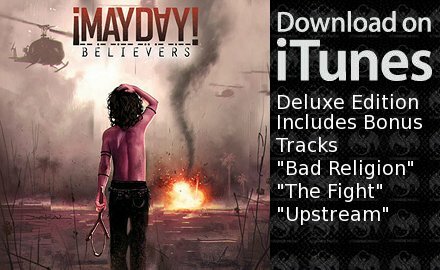 What do you think about ¡MAYDAY! in general and the music that they churn out? It’s dope! It’s a bunch of elements all put together. You have Wrek and Bernz as the emcees, you have Gio and all the guys back there who are really, really talented – they do more than just one thing. Like you go to the show and you see Gio in the back, he’s playing the guitar on some joints, he’s on the beat machine, he’s scratching. Him and Noms are totally in tune with each other. Noms has got the snare with the drum sticks and the bongos and another beat machine. It’s just crazy. Tell me about your verse in the song. What are some significant lines and what can you say about them? I let it out with “These are the days of the road / traveling at night / spread my wings as I ease through the door / I reside under this black light.” It’s just like, “This is my life. Music is my life. Traveling and touring is my life.” I think another significant line is, like everybody on tour knows “About ten shows to get the kinks out.” You know when we get out there we have our stage show then we have to do some shows to get it to where everybody feels comfortable, as far as our set. We’re our worst critics on our stage show because we pride ourselves on good shows. There’s a lot of significance. It’s everything that we’ve been through and it’s everything that we go through. Anybody that does travel the world or the road like that in this setting will probably understand that feeling too. I talk about temptation in there. I said “Down the line / about an hour to drive / I gotta limit the time I get it draped up.” You know what I mean? Like, temptation out there is just everything, good and bad. What’s bad for some people might be normal to us. I know you’re a spiritual person, so how do you coincide those two worlds? I mean we pray. That’s the only way that you can do that: pray and stay grounded. There’s a mission too. There’s a goal out here that we’re doing, so we stay prayed-up and we go on our mission, but the facts are the facts and the things that are going to happen are the things that are going to happen. That’s what’s going to be happening. I call it “Outer Lane”, Wrek and Bernz called it “Sinister Avenue”. It’s the same thing. What is it about the road that is such a captivating and relatable subject for you to write songs about? It’s so relevant in my life. It’s what I’ve been doing and from that you have a bunch of emotions and feels and everything like that about it. It’s what I’m supposed to be doing, writing about what I’m feeling, what I’m thinking, different emotions – and that just hits home. I let the songs speak for themselves, like “Outer Lane”, “My Remedy” and “The Road” itself, with Wrek, Bernz and I from Rolling Stone. It’s just so relevant and there’s a lot of passion because there’s passion in what we’re doing. It just seems that you have a predisposition to it. Like you were made for this. Definitely. I know that. I feel that and I know that. This is the road that was chosen for me. That’s how I feel about it. I accept it and I love it. When did you know that this was the life that was chosen for you? Well, I think performing has always been one of my favorite things to do – whether it’s instruments, vocally or whatever. The day was when I was in Fulton at The Fairgrounds. That’s the first time I met Tech and them. That was really my first hip hop show that I did and the way the people took to it, it’s like a feeling that I can’t really explain. It gave me a high of being up on stage. I love that feeling. I would say 13 years ago. A lot of musicians and acts that have been doing it for a long time, they say that feeling never really goes away no matter how many shows you do. Exactly. You always have that love. It don’t matter what you’re going through before, once that beat hits it’s on. It’s a job but it’s so much fun also. We’re actually having fun out there doing what we’re doing because that’s what we love to do. Is there anything you want to say in closing about the song and ¡MAYDAY!’s album. It’s a dope, crazy album. I love the album. I want to thank ¡MAYDAY! for even hollering at me to get on that record. I love to be a part of it and I love the record. I think it came out. I can see the Twitter and fans on the internet are really feeling that record too.